In large bowl, beat cream cheese, 1/4 teaspoon of caramel extract, and vanilla until well blended. Add whipping cream and whip until mixture is creamy and thick. Add 4 packets of Splenda to mixture and stir well. Set aside. In separate bowl, mix 2 tablespoons melted butter, a pinch of salt, and pecans. Press pecan mixture onto bottom of pie dish as a crust. Place cream cheese mixture on top of crust, spreading it evenly. Add optional topping or cover and place in refrigerator. Whisk 1/2 cup Splenda with 2 tablespoons water in saucepan over medium-high heat until sweetener dissolves. Bring mixture to boil, and whisk every 30 to 60 seconds until it reaches a brown color (about 10 minutes). Add 2 tablespoons butter and whisk until melted. Whisk in 1/4 cup whipping cream, 1/2 teaspoon caramel extract, and salt to taste until evenly combined. 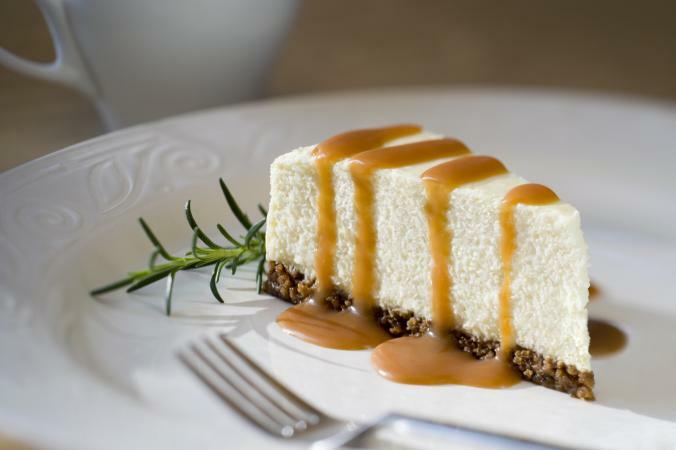 Drizzle caramel topping on top of cheesecake. Chill cheesecake at least 4 hours. If you don't have caramel extract, use vanilla as a substitution. Top cheesecake with an optional low-carb whipped cream recipe. Beat 1/2 cup cream, 1 packet of Splenda, and 1/2 teaspoon of vanilla until mixture reaches a whipped-cream consistency. Place cheesecake crust and mixture (topped with low-carb whipped cream if desired) in six to eight clear glasses, wide-mouth jelly jars, or mason jars instead of a pie dish. Use erythritol or stevia in place of Splenda. Going low-carb can be difficult, especially if you have a sweet tooth. Choosing low-carb cheesecake means indulging in a rich, creamy treat without the guilt that often comes with high-carb desserts.